Mark your calendar for the 10th Annual Greenwich Holiday Stroll Kickoff Party to benefit Kids In Crisis hosted by Vineyard Vines, Thursday, November 29, 6pm - 8pm, Vineyard Vines, 145 Greenwich Avenue, Greenwich. Cocktails, holiday refreshments and 20% of all sales will be donated to Kids in Crisis. Vineyard Vines will also provide complimentary gift wrapping during the event! SHOP TO SUPPORT KIDS IN CRISIS, November 29! $5.00 from every photo package from Photos with Santa at the 10th Annual Greenwich Reindeer Festival & Santa's Village at Sam Bridge Nursery & Greenhouses will be donated to Kids In Crisis during the 10th Annual Greenwich Holiday Stroll Weekend presented by Whole Foods Market, Saturday, December 1. $5.00 of every wreath (over $50.00) sold at Sam Bridge Nursery & Greenhouses during the two-day Greenwich Holiday Stroll Weekend presented by Whole Foods Market will be donated to Kids In Crisis, Saturday, December 1. Purchase a Reindeer Ornament made from recycled Pepsi cans at the 10th Annual Greenwich Reindeer Festival & Santa's Village! These unique fair trade ornaments are made by artists in Kenya, Africa. $2.00 of every ornament is donated to Kids In Crisis. There will also be a Giving Tree for Kids In Crisis at SAM BRIDGE NURSERY & GREENHOUSES throughout the 10th Annual Greenwich Reindeer Festival & Santa's Village, November 23 through December 24. Please consider purchasing an item from the Giving Tree. Your support will help provide loving care for neglected children staying in the Kids In Crisis shelters. 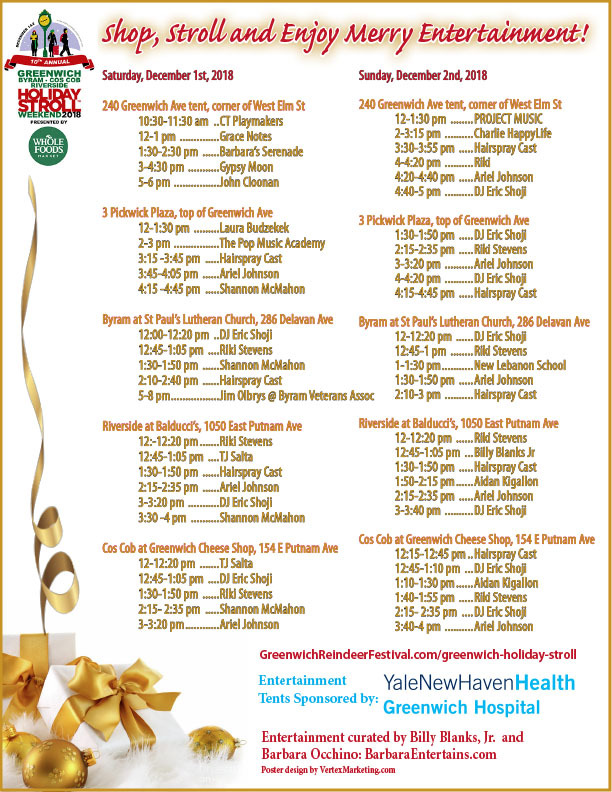 The 10th Annual Greenwich Reindeer Festival & Santa's Village and the 10th Annual Greenwich Holiday Stroll Weekend presented by Whole Foods Market proudly support Kids In Crisis.